FYJC Fourth Merit List 2017: School Education and Sports Department is going to provide admission into First Year Junior College for Mumbai, Nagpur, Aurangabad, Nasik, Pune and Amravati regions. Earlier it had released the General Merit List, First, Second and Third Merit List as per the schedule mentioned. Candidates whose name does not exist in the previous list can check the FYJC Fourth Merit List 2017 from the official site mumbai.11thadmission.net. Nearly 2, 36,166 students had submitted their application forms for 11th Admission in Mumbai region and 2.92 lakh seats are available in 750 plus Junior Colleges. Out of 2.36 lakh students, about 1.77 lakh students got admission from the previous merit lists. For 4th round over 23,000 seats are added to the pool for the centralised process. Merit List is prepared based on cut off marks. 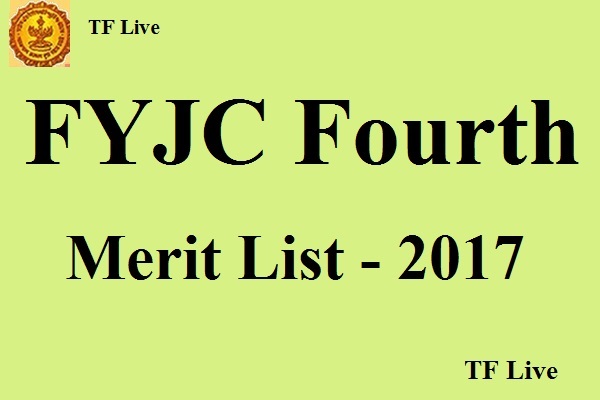 Check FYJC Admission 4th Merit List Cut off Marks from the official site. Candidates can check FYJC 11th Admission Fourth Merit List by following the steps mentioned below or through official site mumbai.11thadmission.net. Enter your application number in the given field and check whether your Roll Number or Name exists in the FYJC Fourth Merit List 2017. Schools Education and Sports Department provides admission into 11th and 12th Standards based on his merit marks. Admission of First Year Junior College 4th Merit List will commence from 7th August to 8th August 2017. Classes for 11th Standard will start from 9th August 2017.